Teenage pregnancies are falling in Hartlepool but it remains the second highest in the region for its conception rate. 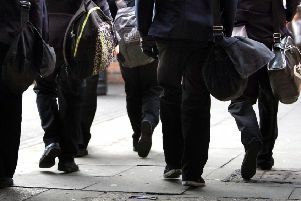 The number of teenage pregnancies in South Tyneside has fallen, according to new figures. According to statistaics from the Office of National Statistics South Tyneside had a conception rate of 24.0 per 1,000 women under the age of 18 in 2016. The borough had 58 conceptions, four down from the 2015 figures. The number has fallen significantly since 1998, when there was 185 conceptions and a 64.9 conception rate per 1,000 women in the age group. Despite this, the North East continues to have the highest rates in the country. Middlesbrough had the highest rate, at 36.5 per 1,000, followed by Hartlepool which has a conception rate of 34.9 per 1,000 women and Sunderland which stands at 31.9 per 1,000 women. Sexual health charity FPA has welcomed the drop in teen pregnancies but expressed concern that the achievement is being jeopardised by cuts to sexual health services that could mean these figures start reversing. Natika H Halil, chief executive of the sexual health charity FPA, said: “It’s so concerning that local authorities in the North East are facing such massive cuts to their public health budget, which can then lead to sexual health services closing, or have their staff and funding reduced. Coun Tracey Dixon, lead member for independence and wellbeing, said: “It is good news that the number of teenage pregnancies in South Tyneside is continuing to fall and has dropped by around two thirds over the last 20 years. “It is comforting to know that the efforts the council has made in this area are paying off. However, we are not complacent and accept there is still work to do. “We will continue with a programme of prevention work across the borough. “This includes our healthy schools programme, which aims to embed best practice across all health and wellbeing issues in school settings, as well as raising awareness of teenage pregnancy and promoting emotional resilience to help reduce risk taking behaviour among young people.